with all the cool location lighting stuff I’ve been talking about here in my blog, and in my live sessions (as seen above–of course, you have to provide the flash and I use two Nikon SB-800s because I shoot with Nikon gear, but the kit works with any off-camera hot-shoe mounted flashes). The kit includes two Lastolite tri-grip diffusion panels, two lightweight (yet surprisingly sturdy) 8′ light stands with two regular Bogen/Monfrotto clamps for holding the diffusion panels; and two of their “Justin” clamps, which let you mount hot-shoe flashes and position them in any direction using the built-in ball head, and two of the same lightstands come with that. Plus, it comes with a Westcott 6-in-one reflector and a very slickly designed Impact boom stand with clips so you can position the reflector right where you want it. The kit assumes you already have a flash, so it’s everything but the flash (it’s all the gear shown above) and the whole package is just $495, which is an incredible deal for the results you can get (you can see this package in action by going back to my post on February 22nd). 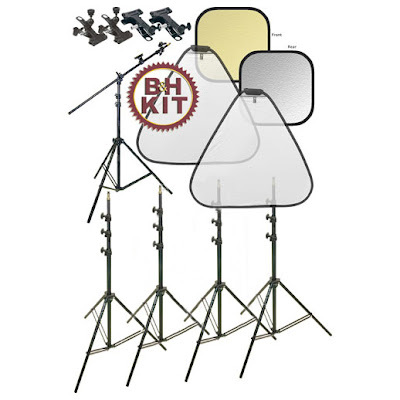 Click here to jump to B&H page on this kit. (Don’t forget; if you call B&H, NAPP members get free shipping, which saves you $27.65. Well, it does if you’re shipping to Tampa anyway). Although it’s called the “Scott Kelby Location Lighting Kit,” I have to give credit to the amazing Joe McNally (master of the wireless flash, and one of the most talented and gifted working photographers/instructors in our industry today), because I learned the whole technique (of shooting the on-camera style flashes through the Lastolite Diffusers with Justin Clamps) from him. Many thanks to Joe for turning me onto to this amazingly light, portable, and easy-to-use system that’s changed everything for me. My personal thanks to Joe for all he’s taught me, and all he continues to teach me. (If you’re going to Photoshop World, make darn sure you catch Joe’s amazing sessions. He will change the way you approach a lot of things, and he’ll inspire you with this amazing images from his years shooting with National Geographic and Sports Illustrated, to name just a few. Also thanks to the wonderful folks at B&H Photo (Gabe, Steve, Manny and crew) for putting this location lighting kit together. I’m so honored, and can’t thank you enough for making it so easy for NAPP members to get their hands on all this cool gear. You rock! As of Aug 11, 2017, B&H shows this as discontinued.